So when is the best time to visit Scotland? 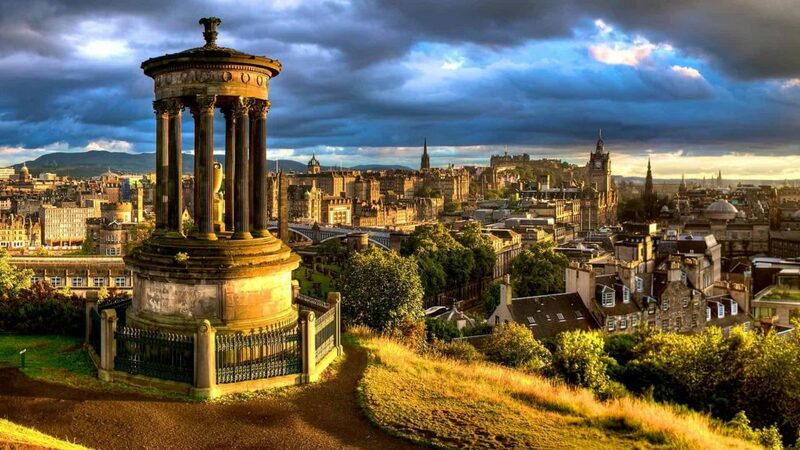 How about visiting Edinburgh to escape from Scotland’s rain? If you spend any amount of time reading through Scotland’s many travel blogs you’ll quickly come to realise they’re all chock-full of an obscene amount of syrupy-sweet adjectives when it comes to describing the country’s landscapes. Words like ‘stunning’, ‘jaw-dropping’, ‘mesmerizing’, and ‘mind-blowing’ – all over-used to some extent and generally a sign that the writer is getting over-excited about some adventure they’ve just had. But to be honest it’s difficult not to write like that when you’re trying to describe this country, and I say that with hand on heart because it’s exactly the kind of writing style I find myself falling into every time I create a new article. You see, you’ll just have to bear with us when we start waxing lyrical about the ‘swooningly-beautiful’ mountain vistas we’ve been hiking through over the weekend. Seriously, how else can we write this stuff? Scotland really is a beautiful place and there’s been more than one occasion when I’ve been on an all-day hike covered in mud and sweat and I’ve got to the brow of a hill and found a view in front of me that’s jaw-dropping. And I mean that in all seriousness. On more than one occasion Scotland’s landscapes have actually made my jaw drop, leaving me standing there looking like I’m trying to catch flies with my mouth. 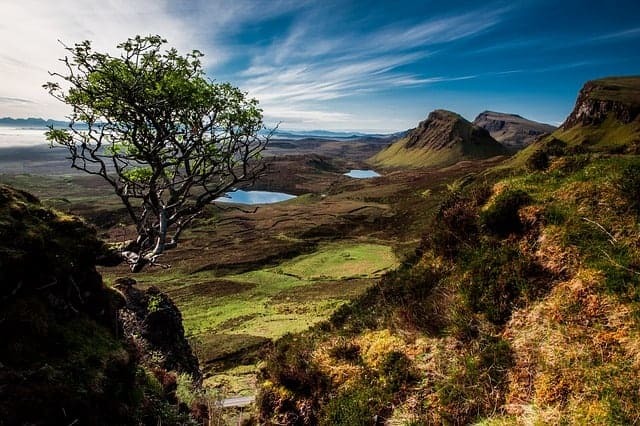 So when you’re reading through an article about a Scotland blogger’s exploits and they start describing the place as mind-blowing, you can be pretty damn sure that it really is beautiful enough to blow your mind. But even so, not everywhere in Scotland is like that. Let’s be honest, if you read a travel blogger and they start describing an inner city slum as ‘a beautifully gritty urban landscape’ you can be fairly sure they’re just trying to get their word count up. Either that or they’ve just finished an article about Glen Coe or the Isle of Skye and they’ve got stuck in a superlative overload. So we can all agree that bloggers tend to get carried away when it comes to describing the good bits about travelling around Scotland when the sun is shining and the skies are blue. What you don’t find written about so much is the other 80% of the time when the sky is overcast, there’s a ferocious wind blowing and it’s drizzling. And not the kind of refreshing-but-brief drizzle you get in the middle of summer, nope, I’m talking about the near-constant annoying-as-hell freezing-cold drizzle that manages to soak every single item of clothing you’re wearing. The kind of drizzle that’s utterly depressing and impossible to dry off from without a complete change of clothes. Why don’t you hear so much about that kind of Scottish weather? I guess it’s because it doesn’t make for particularly fun reading, and who’s going to encourage people to visit a place if they tell them how grotty the weather is? So in this article, I’m going to address this issue of the reality of Scotland’s often crappy weather, but I’m also going to tell you why you really don’t need to worry about it. You see, having a good time in Scotland isn’t about avoiding the bad weather, it’s about being smart when the weather inevitably turns bad. It’s about going to the right places where it doesn’t matter if it’s going to be grey and miserable outside because you’re already somewhere warm and cosy indoors. Read on and I’ll explain exactly what I’m talking about. Look at the majority of Scottish travel websites and you’ll see umpteen photos of green and lush Highland glens bathed in a gorgeous golden glow of summer sun, where birds flitter aimlessly on a gentle breeze and tiny wisps of cloud drift along an otherwise perfectly blue sky. It’s enough to make you get your credit card out and book that all-inclusive Scotland break you’ve had at the back of your mind for the last five years. And truth be told, if I didn’t actually live here I’d probably believe that’s what it’s like all the time too. The truth, however, is slightly different. While the UK as a whole is known for its cold, wet weather, Scotland tends to get the worst of it. Compared to the rest of the UK our weather is just that little bit wetter, just that little bit cloudier and windier, and our average temperatures are more-often-than-not a few degrees cooler than other parts of Britain. And just because you’ve decided to head to the south of Scotland instead of the north doesn’t mean you’re going to escape a good Scottish soaking either. Pretty miserable right? Especially if you’re looking at that graph in a nice hot country (you lucky person!). Even in August, in what is historically the UK’s hottest month, the Scottish Borders had to put up with 144 mm of rain and a full 27 rainy days in August 2018. And that’s in the south of the country in summer. Now let’s look at the same time of year in the north. It’s even worse! 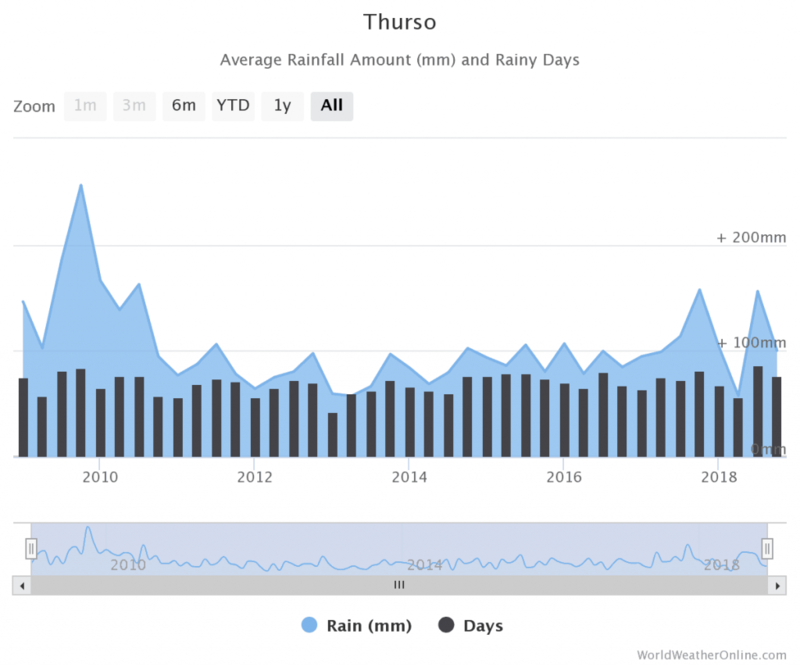 If you were in Thurso in the north Highlands in August 2018 you’d have had to brave 172 mm of rain over a full 30 days. That’s one day out of the entire month when it didn’t rain. ‘But surely’, you must be thinking, ‘it’s not all bad?’. Well actually no, it’s not all bad, and you’ll frequently find that while the lowlands are covered in mist and low clouds, the more elevated parts of the Highlands are being bathed in glorious sunshine. It’s also quite common for the west coast to be subjected to heavy rain due to low pressures and warm air from the Atlantic Ocean while the east coast remains completely dry. The point I’m making here is that there’s no hard-and-fast rule when it comes to Scotland’s weather, and just because you’ve gone to a certain area at a certain time of year doesn’t mean you’ll escape the frequent downpours. By the way, here’s a good resource about The Best Time to Visit Scotland, and don’t forget to check out my Weather Forecast Page for the lowdown on today’s weather. That’s a difficult question to answer, and to be honest I don’t think there is a particular best time because it really depends on what sort of holiday you’re hoping to have. If you’re coming here to enjoy our snow sports then obviously you’re not going to be here in summer. Ski season in Scotland usually runs from December through to early April although because our weather is so changeable some years have a much heavier snowfall than others (my experience has been January and February are your best bets for skiing in the Highlands). If you’re coming here to hike through our wonderful landscapes then April to July are a fairly safe bet, although the weather does seem to be getting wetter with a fairly consistent rainfall throughout the year. March to May is often sunniest on the west coast – especially the Hebridean islands – while June to August is normally drier on the east coast. November to February can be dreary thanks to the short days, but then those months are also the loveliest times of the year when it’s cool, crisp and sunny. 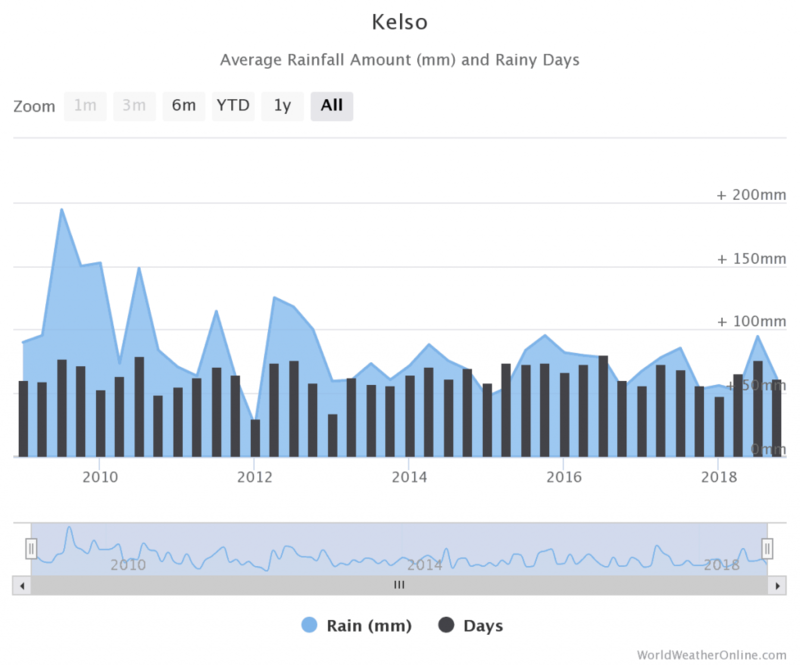 As we saw earlier, rainfall in Scotland can be high, especially in the western Highlands which get around 4500 mm each year, but you can minimize the number of grey days you’ll see by heading south – particularly towards the east coast which averages around 550 mm over an average 170 days per year (so says Wikipedia). Which leads me on to the main point I want to make in this article. While it’s impossible to predict in advance exactly what Scotland’s weather is going to do, if you want to minimize the number of rainy days you’ll see you could do a lot worse than visit the southern end of the east coast in spring and summer, especially if you head to a big city which has loads of attractions you can dive into if dark clouds start looming overhead. I’ll admit I’m biased because I live there, but whenever I’m asked ‘where’s the best place to visit in Scotland when it’s raining’, I always say Edinburgh because there’s just so much to see and do. This country’s capital city is home to a wide range of tourists attractions that cater to all age groups and the majority of them rival any attraction in any other city worldwide. Aside from the obvious Edinburgh Castle you’ve got Holyrood Palace at the opposite end of the Royal Mile and the Scottish Parliament building across the road – all fantastic places to visit in their own right. But you’ve also got the nation’s portrait, classical and modern art galleries in the city centre (all of which are free to enter) and the Scottish National Museum just a few minutes walk away. There are historic buildings like John Knox’s house and Gladstones Land situated within easy walking distance of St. Giles Cathedral (one of the finest cathedrals in Scotland) as well as popular attractions like Camera Obscura and The Scotch Whisky Experience. And that’s before you’ve visited other famous places like Greyfriars Kirk (home of the wee dog, Bobby) and Mary King’s Close. But perhaps the best thing about visiting Edinburgh is when the clouds eventually break and the dark clouds turn into blue skies there are loads of green spaces to enjoy. In fact, Edinburgh has more parkland per acre than any other city in Britain, with an enormous area to explore at Holyrood Park (an enormous extinct volcano) just a few hundred yards from Holyrood Palace, and the vast Pentland Hills just a short taxi ride away to the south of the city. And perhaps best of all, because the city is so compact getting to most of these destinations is easily achieved on foot so you’ll never find yourself traipsing through the rain for hours trying to find something to do. Not that you would anyway because there are more bars and restaurants to enjoy than you could ever fit into a single holiday, most of which serve top-quality local produce. Anyway, I could go on and on about all the amazing things you can do in Edinburgh when it’s raining but the list would be big enough to fill ten articles before I start to run out of ideas. So instead, I’ve included my top ten favourite indoor Edinburgh attractions that are all fairly close together, so any bad weather needn’t mean you get a soaking walking between them. They’re not in any particular order but they all offer a great experience, and I hope you have as much fun visiting them as I did. The Camera Obscura is one of the oldest purpose-built attractions in the United Kingdom, and tens of thousands of visitors pour through its doors each year. Camera Obscura and World of Illusions is located in a prime location on the Royal Mile, not far from Edinburgh Castle, and more or less opposite The Scotch Whisky Experience. Visitors can experience six floors of interactive exhibitions which are designed to confound, confuse, and amuse in equal measure, with exhibits showcasing various aspects of optical illusions using light and colour to enthrall visitors of all ages. There’s a section dedicated to holograms, another featuring a mirror maze, and yet another with a swirling vortex tunnel. Each area is designed to push your senses to the limit with some extremely high-tech trickery powering the shows. But the humble beginnings of the attraction were almost the complete opposite of the in-your-face light show that you see today. In the early 18th century, an Edinburgh telescope maker called Thomas Short built a display for his work on Calton Hill, with his largest telescope eventually passing to his daughter Maria Theresa Short in 1827. Maria continued exhibiting her father’s instruments on Calton Hill for many years, but in 1851 she was forced to relocate the collection after the city authorities demolished her observatory. She then moved the exhibits to their present location on Castlehill where they continued to remain a popular visitor attraction until her death in 1869. The site then passed into the ownership of Patrick Geddes, a Scottish urban planner and entrepreneur who saw the potential of the ‘Camera Obscura’ as the centrepiece to an exhibit demonstrating the science of urban planning. The site was renamed the Outlook Tower and was rebuilt with each floor showcasing a different theme related to the science of town planning. At the very top was the attraction’s premier exhibit – The Camera Obscura – which still exists today in the same location as it did over a hundred years ago. The camera wowed crowds through its use of light and mirrors which projected an image of the city onto a whiteboard at the top of the tower, at least on those rare days in Edinburgh which were bright and sunny! Even so, the Camera Obscura pulled in thousands of visitors each year and to this day remains the highlight of the attraction. Thomas Geddes died in 1932 and for a time it was uncertain whether the instruments in the tower would be lost to the public forever, but in 1966 Edinburgh University took ownership and maintained the building for the next sixteen years before handing it over to private ownership in 1982. The Patrick Geddes exhibits were scaled back and the development of the World of Illusion that we see today began, although there’s still an exhibit devoted to Geddes on the fourth floor. Thankfully the current private owners have stayed true to the origins of the very first attraction so that not only are there amazing visual illusions on every level but there’s an element of education about the study of light, photography, and the city woven into the exhibits. The National Galleries of Scotland controls three galleries housing great Scottish artworks, all of which are based in Edinburgh. While the Scottish National Gallery and Scottish National Portrait Gallery are easily accessible from the city centre, the Scottish National Gallery of Modern Art is located slightly further afield to the west of Dean Village. Luckily for tourists trying to escape Edinburgh’s frequent downpours there are regular (and free) bus services which ferry passengers between the Scottish National Gallery and the National Gallery of Modern Art. The journey to the gallery is well worth it though, as not only is it spread out across two fascinating early 19th century buildings but the landscaped grounds are full of artworks that can be enjoyed in addition to the ones housed inside the main buildings. The primary purpose of this gallery is to showcase the Scottish national collection of contemporary art dating from the early 20th century to the present day, and the vast collection covers all forms of media across 6000 pieces, from paintings and video to sculpture. The collection is a genuine feast for the senses and many thought-inspiring artworks are guaranteed to give you cause for quiet contemplation, and the combination of elaborate garden grounds and gallery rooms spread across the two buildings will keep you entertained for hours. The galleries are divided into the Modern One and the Modern Two, and both have equally interesting histories. While the very first gallery of modern art was located at the Edinburgh Botanic Garden, it soon became apparent that much bigger premises would be needed to house the growing collection, so in 1984 the gallery moved to its first location (Modern One) on Belford Road and then expanded into an opposite building (Modern Two) in 1999. Modern One is famous for its ever-changing exhibits and the permanent collection includes pieces from renowned artists like Francis Bacon, David Hockney, Tracey Emin and Andy Warhol. Across the road, Modern Two houses selections from the permanent collection as well as a continually updated catalogue of exhibits, and interested members of the public can view the history of modern art media in the comprehensive library and archives. Outside, a sculpture park created by the famous landscape designer Charles Jencks dominates the lawn of Modern One, where a huge serpentine mound surrounds a crescent-shaped pool of water. While walking around the grounds you’ll be able to get up close and personal with artworks including the bronze sculpture ‘Master of the Universe’ by Eduardo Paolozzi which is based on a drawing of Sir Isaac Newton, and the installation on the façade of Modern One by the artist and musician Martin Creed. This is a really great attraction in Edinburgh, but one that’s criminally under-used in my opinion, so do yourself a favour and add it to your itinerary while you’re in the city. One of the best art galleries in Edinburgh is also one that can be easily overlooked by tourists as the building is partly hidden between Queen Street and North St. Andrew Street. 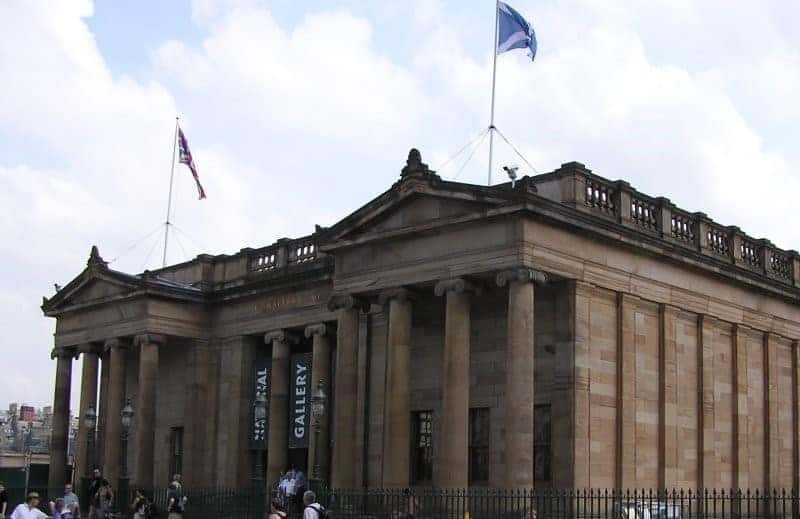 But it would be a shame to miss out on a visit to this attraction because The Scottish National Portrait Gallery contains the national collection of portraits and the national photography collection, both of which are studies of famous Scots throughout history which are genuinely fascinating to see. In total, the collection boasts over 3000 paintings and sculptures, plus 25,000 prints and drawings, and an incredible 38,000 photographs. The paintings cover an extraordinary duration of Scotland’s history, with the earliest portrait of James 4th dated to 1507, while the oldest photograph date back to 1868. The photos are particularly interesting as they detail the life of the average working man in Scotland, something that’s often missing from earlier artworks, and these images give a fascinating glimpse into Scottish life in the latter part of the 19th century. The impressive architecture of this building features a collection of exterior statues including famous Scotsmen like David Hume and Adam Smith while the main entrance hall displays a beautiful frieze of important Scots throughout the ages, from Saint Ninian – the 5th century Pictish missionary – to Robert Burns – the 18th century Scottish poet and lyricist. The building stretches out symmetrically on either side of the main hall with the artworks displayed over an expansive three floors. Many Victorian features are still intact, with elegant stone facades featuring in many rooms, and the west side of the gallery features lots of photo-worthy coved ceilings on the upper floors. Before the gallery was built a comprehensive collection of Scottish portraits had been amassed by the 11th Earl of Buchan, but having no official public home for the collection it was decided that a national gallery should be built in Edinburgh. Although the London government refused to step in and fund the construction of the building the owner of the Scotsman newspaper, John Findlay, donated the entire cost of the gallery at his own expense. As the construction was in private hands and not under government control the building work was finished quickly, and it’s for this reason that one of the grandest (and oldest) portrait galleries in the world now resides in Edinburgh (and thanks to an extensive renovation in 2011, it’s also one of the largest). The gallery publicly displays an impressive 850 works at any one time and visitor facilities include an education centre, shops, and a café. The Scottish National Gallery is virtually impossible to miss if you take a walk through the centre of Edinburgh because not only is it one of the biggest buildings in the city but its location dominates the ever-popular Princes Street gardens. If you’re a new visitor to Edinburgh you can’t help being impressed by the huge neo-classical gallery and the adjacent Royal Scottish Academy (RSA) building which sits behind it. Both galleries have huge visitor numbers throughout the year, partly due to the quality of art on offer, but also because it’s free to view these masterpieces (although there are charges for some exhibitions). The galleries display some of the most significant art collections in the world including masterpieces by Rembrandt, Vermeer, Constable, Turner, Monet, and Van Gogh, while the biggest part of the collection covers the entire history of Scottish painting including works by Ramsay, Raeburn, Wilkie and McTaggart. There are too many artworks to discuss in this article but be sure to keep your eyes open for one particular Edinburgh favourite. This artwork is the depiction of the Reverend Robert Walker skating on Duddingston Loch, an image which has woven itself into Edinburgh culture after Sir Henry Raeburn painted it in 1795. In addition to being the minister for Canongate Kirk, the Reverend was also a member of the Edinburgh Skating Society (the oldest club of its kind in Britain), who met regularly on the outskirts of the city to skate on the ice-covered lochs during the winter months. The present Scottish National Gallery building was designed by celebrated architect William Playfair to house the national art collection of the RSA, and in 1850 Prince Albert marked the beginning of its construction by laying the very first foundation stone. The building continued to house the national collection until 1912 when the RSA moved into the adjacent Royal Scottish Academy building, and after extensive remodelling the National Gallery re-opened with an emphasis on presenting a selection of Scottish and European art, a theme which remains to this day. By 1970 it was decided that additional storage space would be required to house the nations artworks and so an extensive series of basement galleries were constructed, and in the early 2000s an underground connection was made to the home of the RSA so that the separate buildings in effect became one unit. This underground area is particularly popular with both tourists and locals as it houses an excellent restaurant and café, with an equally high-quality shop selling copies of some of the artworks that can be seen in both galleries. The entrance is located at the same level as Princes Street gardens and is a great place to stop off for a bite to eat after enjoying the impressive collection of priceless artworks. Completed in 2004, the Scottish Parliament building in Edinburgh is the home of the Scottish government and is a fascinating example of modern architecture. Located at the bottom of the Royal Mile on 4 acres of land, the building is perfectly situated as the seat of Scottish power, with the ancient Holyrood Palace directly opposite and the rolling peaks of Holyrood park just a short walk away. The building is in use daily with more than 1000 permanent staff assisting 129 MSPs in their duties, and frequent debates are held in its central chamber where viewing galleries allow over 300 members of the public to watch important discussions about the state of the country. However, the early days of the parliament building were filled with controversy stemming from its unusual architecture and the huge over-run of its budget, which was a ten-fold increase in its original estimate. Initially, three sites around Edinburgh were considered as possible locations for the building, but a last-minute entry from the site of the Scottish and Newcastle brewery eventually won favour with the city council. The location where the Parliament building now resides seems to perfectly sum up Scotland, with the impressive Salisbury Crags of Holyrood Park to one side, the majestic Holyrood Palace bordering another side, and the ancient Royal Mile running alongside it and up towards the centre of the capital city. An international competition was organised in 1998 to create a design for what would become one of the most important buildings in Scotland, and eventually the Spanish architect Enric Miralles was chosen. Although many people were in favour of Miralles unusual abstract designs the eventual cost of construction caused a lot of controversy with the use of public funds escalating from an initial estimate of £40 million to a final cost of £430 million by the time it was completed in 2004, three years behind schedule. Even so, the building won many international awards for its architecture and visitors are welcome to explore it year round. On non-sitting days, usually Monday, Friday, and weekends, visitors can view the main hall and access the public galleries of the debating chamber and the main committee rooms. Guided tours are also available on non-sitting days which allow visitors to access the floor of the hall, the garden lobby, and the committee rooms, which is an interesting (and free) way to spend a couple of hours on a rainy day in Edinburgh. John Knox’s house in the middle of the Royal Mile is a historic building that was reputedly lived in by the infamous Protestant reformer in the 16th century. Although John Knox only supposedly lived in the house for a short time it’s his association with the building that prevented it from being demolished in 1840, a time when many other derelict buildings in Edinburgh were being torn down. The house was built around 1470 which makes both it and the adjoining Moubray House the only surviving medieval buildings on the Royal Mile. Today, the house is highly regarded for the museum exhibits inside which include time capsules from the 1840s that describe how the house was saved from destruction, as well as retelling the story of the Scottish Reformation and the part that John Knox played in it. Whether or not Knox spent much time in the house is a matter of debate. However, it’s known that during the time he was alive the house was owned by a wealthy Catholic, so it’s unlikely that the Protestant Knox would have chosen to live there. Even so, the building would have been well-known to Knox while he was alive mainly because it’s situated so close to St. Giles Cathedral where he spent his latter years preaching sermons to the great and the good of Edinburgh. The house has a lot of features that were popular amongst the wealthy residents of Edinburgh in the 15th century including a beautiful wooden gallery and ornate hand-painted ceilings, but these are unlikely to have been commissioned by a religious man like Knox. Instead, it’s more likely that they were installed by the 16th century goldsmith James Mossman, the loyal supporter of Mary Queen of Scots who was hung, drawn, and quartered for creating counterfeit coins during the ‘Lang Siege’ at Edinburgh castle in 1573. After his death, the house was handed over to James VI of Scotland and was lived in by many wealthy residents until it gradually fell into disrepair. Today, the house has fascinating tours that will take you around its perfectly preserved rooms while telling you all about the history of one of the most critical times in Scotland’s history, and if you’re walking along the Royal Mile and notice the heavens start to open you could do a lot worse than spending a couple of hours inside the John Knox House. I personally love this part of Edinburgh, and if the weather isn’t too bad I recommend you get away from the usual tourist places on the Royal Mile and just go exploring the nearby side streets and closes. Much of the architecture is hundreds of years old and there’s no better way to experience the Old Town than to simply get lost in its maze of alleyways and footpaths. If you want to know how the residents of Edinburgh lived in the 16th century, Gladstones Land on the Royal Mile will give you a glimpse into their lives in this remarkable medieval building. The ‘Land’ is actually an old townhouse situated close to Edinburgh Castle which is owned and managed by the National Trust who have taken painstaking measures to renovate the interior so it looks just the same as it would have in the early 1600s. While the Georgian House in Edinburgh’s New Town provides a glimpse into the life of the wealthy in the 1700s, Gladstones Land transports you back in time even further to when both the rich and poor shared apartments in the ramshackle tenement buildings of the Old Town. The building is known to have been built in 1550 but it was only after extensive refurbishment in 1617 by the merchant Thomas Gledstane that it was marked out as a home for Edinburgh’s wealthy residents. Gledstane had the foresight to rent out parts of the building and we know from public records that merchants, ministers, and guild officers lived there before the construction of the New Town. The obvious popularity of the building can be seen in its size, rising six storeys above what would have been the foul-smelling streets of 16th century Edinburgh, although it’s likely that the rooms inside were much smaller than those we see today. In the cramped conditions of those times there would have been entire families crowded into single rooms, with the city trades people and merchants taking residence on the lower floors and the wealthy living on the middle levels. The very poorest had to suffer with living at the top where every bucket of water had to be laboriously carried up all those flights of stairs. The height of the Old Town buildings meant that the poor resorted to chucking their buckets of human waste out of the window instead of carrying them downstairs, which was accompanied by a cry of ‘gardyloo!’, followed by a deluge of raw sewage. The streets of Edinburgh back then must have absolutely stunk! By the time the 20th century came along Gladstones Land had been condemned and was listed for demolition, but thankfully the National Trust recognised the importance of the building and over the course of the following years it was restored to its former glory. As a tourist attraction, Gladstones Land has become one of the most popular in the city for anyone with an interest in history, and for a small fee you’ll be guided around the rooms and told about the history of each feature inside. From the flagstone floors in the kitchen to the elaborately painted ceilings in the bedroom, each room has a tale to tell which will transport you back into 17th century Edinburgh life, and I think it’s worth visiting this attraction whatever the weather is doing outside. If you’ve ever looked through photographs of Edinburgh on the internet there’s no doubt you’ll have come across a picture of Saint Giles Cathedral on the Royal Mile. Its distinctive 15th century crown steeple is one of the most-viewed features of any building in the city and it easily takes its place alongside Edinburgh Castle and Holyrood Palace as one of the most historically significant buildings in Scotland. The cathedral has been a focal point for religious activity in Edinburgh for over 900 years although the building that we see today can trace its roots back to the 14th century. 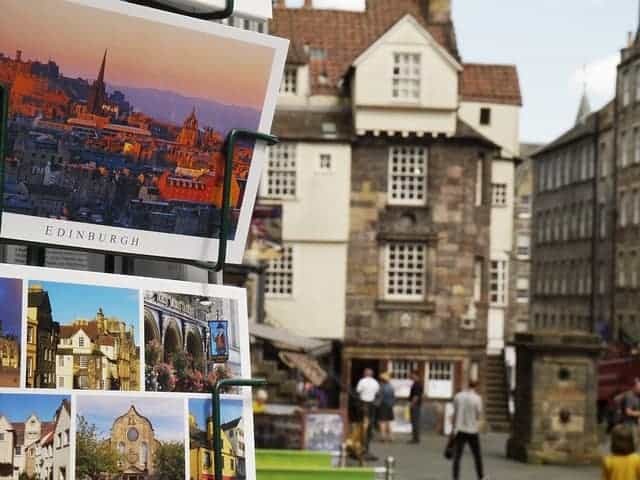 Due to its central location in the Royal Mile, St. Giles has become a popular tourist attraction and it’s an ideal stop-off point between walks to Holyrood Palace and Edinburgh Castle. Although this cathedral has been officially designated as an A listed building and is of the great historical importance, it’s not in the truest sense of the word an actual cathedral. As the Church of Scotland doesn’t officially have either bishops or cathedrals, St. Giles is often referred to in its much older title as the ‘High Kirk’. There’s a huge amount of history in this building but while you’re walking round it take a look at the four enormous 12th century central stone pillars which are thought to be the oldest parts of the cathedral, and also some of the last remaining structures from a fire which gutted the majority of the original cathedral in the 14th century. St. Giles is still an active place of worship so entering it might not be possible during times of prayer, but during the week tourists are free to explore its chambers and halls. There are five services held every Sunday and around fourteen services take place every week, often with the St. Giles Cathedral Choir singing. The choir is acclaimed throughout Europe and America and it’s impressive to listen to them sing in full voice during the weekly leading of the worship. They’ve even released a few CDs which can be purchased from the gift shop alongside other souvenirs which can be picked up to remind you of your time in Edinburgh. St. Giles Cathedral also has an excellent café with top-quality home baked cakes which are perfect for enjoying after a busy day of sightseeing. The Georgian House is a National Trust managed townhouse that was originally built in 1796 as part of Edinburgh’s fashionable New Town development. The New Town is considered to be a masterpiece of town planning design and has been designated a UNESCO world heritage site for the quality of its Georgian architecture. In the late 17th century the high-rise tenement buildings of Edinburgh’s Old Town were becoming diseased and filthy, with the city’s poor and destitute mixing alongside the wealthy gentry in the crowded residences, so James VII created a new residential area to the north to encourage wealthy traders to settle down and make permanent homes in the city. It was left to the architect James Craig to come up with a design for the New Town and he proposed a simple grid style with the main road of George Street (named after King George III) linking two large gardens at either end. To the west end of George Street is Charlotte Square, a large area of private gardens that mirrors St. Andrews Square to the east, and it’s within the buildings that surround the square where you’ll find the Georgian House at building number 7. This 18th century townhouse was built to accommodate the wealthy Edinburgh residents who could afford to escape the dilapidated Old Town, and over the course of 170 years from 1796 to 1966 a total of 5 wealthy families called 7 Charlotte Square their home. Today, however, it’s owned and managed by the National Trust for Scotland who have accurately restored the interior so that it closely resembles the layout of how it would have looked when it was first used as a family home over 200 years ago. The museum is set over five levels from the basement to the third floor and you’re free to walk around the house at your own pace and head in any direction you like, but it makes sense to start at the bottom and work your way up through each floor. The décor and furniture on each level are just as they would have been back in the early 19th century and it really gives you a feeling of walking back in time as you wander through each room. Inside the building you’ll see lots of original pieces of silverware, bone china, glassware, and paintings, and you can see just how opulent the lifestyles of the rich were back then with dining and drawing rooms laid out ready for one of the many cocktail parties they would have held. There are also glimpses into the lives of the servants who would have worked tirelessly in the basement and kitchens, while interactive touchscreen displays help to bring the stories of the inhabitants of 7 Charlotte Square back to life. The Georgian House is yet another fascinating step back in time to discover the real-life stories behind the history of Scotland’s capital city. The Palace of Holyrood House (as it’s officially known), is the main residence of the British monarchy in Scotland and is located at the opposite end of the Royal Mile from Edinburgh Castle. The palace has a long history dating back to the 12th-century and it’s still used to host state occasions to this day. Queen Elizabeth II spends one week at the palace at the beginning of each summer, and many tourists wait excitedly for the royal flag to be raised which indicates she’s in residence. The palace offers lots of activities to visitors, including viewing the official state apartments of Mary Queen of Scots, the Throne Room and the Great Gallery, as well as exploring the ruins of Holyrood Abbey and the beautiful palace gardens. There’s also an excellent cafe, one of the best shops of any attraction in Scotland and an exhibition of master paintings in the Queen’s Gallery. As you enter the front courtyard via the ticket office you’re immediately presented with the palatial entrance to the front, glimpses of Holyrood Park to the right, and the ruins of the Holyrood Abbey to the left. But moving forwards through the main door will give you your first views of the palace interior and an inclination of the sights to come. As you wander through the palace rooms you’ll be amazed by the intricacy of the needlework on the tapestries and the beautiful paintings that cover every available space on the walls. The level of opulence is astounding, and fine china, beautiful artworks, and rich fabrics seem to cover every surface. The king’s bedchamber in the east wing is well worth visiting just for the artwork that’s been carved into the ceiling plaster work, so while you’re looking around the room remember to look up as well. The most substantial room in the palace is the Great Gallery which is decorated with over 100 paintings of various Scottish monarchs from throughout history. Although it’s mainly used for banquets today, in years gone by it was used as a chapel, a place where Scottish peers were elected, and even as a ballroom. After you’ve explored the inside of the palace it’s time to walk around the outside (as long as those pesky rain clouds have cleared…). Set over 10 acres they feature a stunning collection of roses, manicured lawns and examples of Scottish plants laid out in the formal style of the 19th-century, while the ruins of Holyrood Abbey will probably be the last section you walk through. Although the abbey roof has long gone the size of the building is still impressive. Constructed in 1128 by King David I, the abbey staged many important events throughout its life including the parliament of Robert the Bruce, the marriage of King James II, and the marriage of King James III. It’s a great attraction to visit and very, very atmospheric. And finally, no visit to an attraction like this would be complete without a visit to the cafe which is, of course, top-notch. The quality of the food on offer is amazing, and although it’s a little pricey it’s well worth the expense. 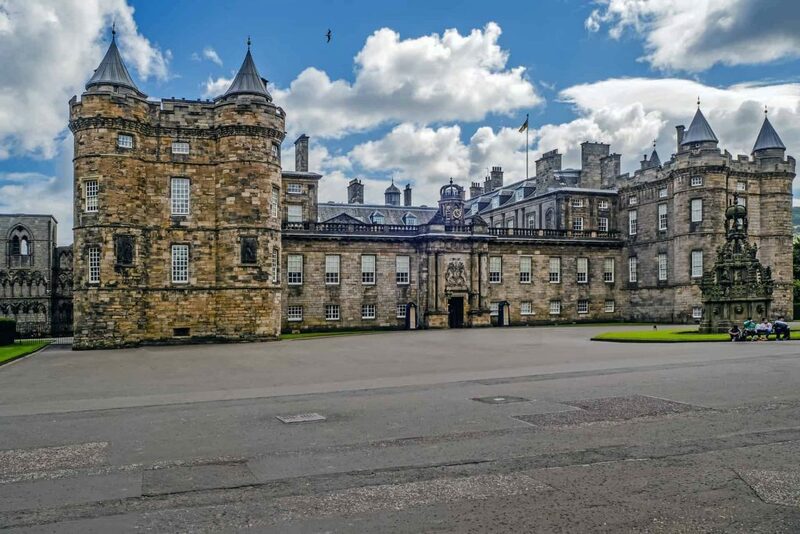 Holyrood Palace is definitely worth the price of entrance whether you want to see one of Scotland’s most historic buildings or just want to hide from the weather. Well I hope this list of the ten best things to do in Edinburgh when it’s raining has given you some good ideas for places to visit when the weather closes in, and I hope I’ve shown you that you don’t have to plan a trip to Scotland around what the weather may or may not do. This list really is just the tip of the iceberg for things to do in Edinburgh and there are a huge number of other attractions you can duck into when it starts to pour, so please check out the rest of the website for more ideas.